USA Hockey announced its end-of-year awards Tuesday afternoon, and one Plymouth-based stand-out received some well-earned recognition. USA Hockey’s National Team Development Program forward Jack Hughes was named USA Hockey’s ‘Dave Tyler Junior Player of the Year’ after an impressive first year in Plymouth. Despite being a 16-year-old for his entire USHL rookie season, Hughes led the top junior league in the country with a two points-per-game scoring average. He led all rookies in points during the season with 54 – and an impressive +26 rating – despite playing in only 27 USHL contests. Had Hughes played a full USHL 60-game schedule with that 2.00 points-per-game average, he would have recorded 120 point on the season; Muskegon Lumberjacks forward Anthony Del Gaizo led the league in scoring with 72. NTDP players don’t play a full USHL schedule as the NTDP’s games are split between the U17 and U18 Teams. 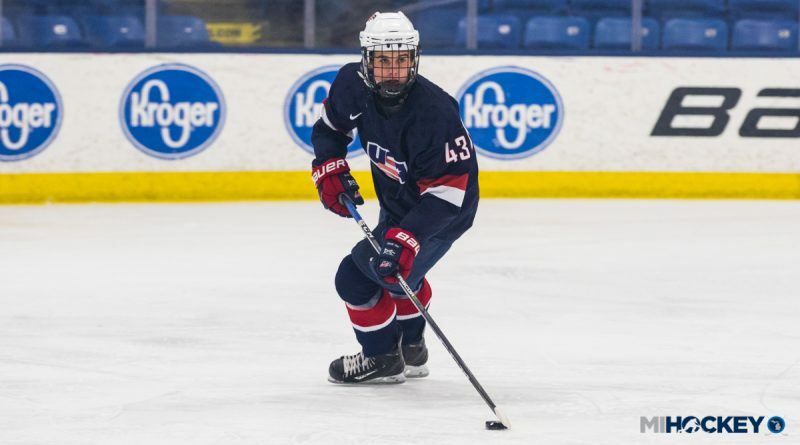 Hughes, the younger brother of NTDP product and University of Michigan defenseman Quinn Hughes, was called up to the NTDP Under-18 Team in December, and he became a mainstay on the older squad during the second half of the 2017-18 season. He also has a younger brother, Luke, who played for the Little Caesars 14U team last season. Hughes helped Team USA to a silver-medal finish at the 2018 IIHF Under-18 World Championship, leading the tournament in scoring despite being an under-ager at the prestigious event.